The trailer sets up an almost depressing premise that sees imperfect toys thrown out into a faraway land. Sort of like the Island of Misfit Toys. It then turns into an adventure with a group of these castaways looking for the "big world" in hopes of finding a kid that would like to play with them. The footage then highlights the musical nature of the movie, along with its human characters and many of its setpieces and gags. UglyDolls takes place in the adorably different town of Uglyville, where weird is celebrated, strange is special and beauty is embraced as more than what's on the surface. Moxy and her pals live a blissful day-to-day existence, and, on occasion, looking to the sky, where a new UglyDoll will appear to find its place in this community. Moxy loves her life in this misfit town, but her curiosity about all things leads her to wonder if there's something beyond the mountain on the border of Uglyville. So, she decides to gather a group of her best friends and they set off to find what's on the other side. This leads them to the town of Perfection, where more normal dolls are trained before they head off to the real world to find a child's love. The cast includes Kelly Clarkson, Nick Jonas, Janelle Monae, Blake Shelton Wanda Sykes, Emma Roberts, Gabriel Iglesias and Wang Leehom. Kelly Asbury (Shrek 2, Smurfs: The Lost Village) is in the director's chair, working from a script by Erica Rivinoja and Vivian Wang. 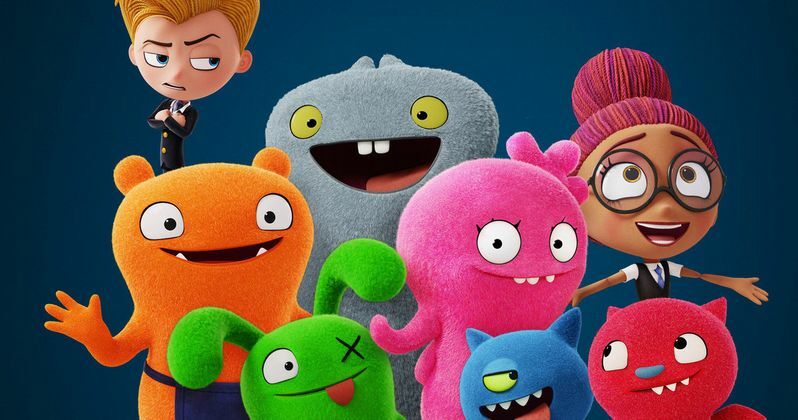 There appears to be a confidence in the final product, as Hulu signed a deal with STX to produce an UglyDolls animated series to go along with the movie. The deal consists of 26 episodes and this seems to mirror what Nickelodeon has done in the past, by taking something like Jimmy Neutron: Boy Genius, then turning it into a series on the network. This looks to follow in the success of similar movies such as Trolls or, perhaps the best example, The LEGO Movie. And why not? The Uglydoll line has been around since 2001 and has proved to be very popular, even winning Specialty Toy of the Year in 2006. In addition to the trailer, the studio has also released a brand new poster, which we've included below featuring all of the colorful main characters. UglyDolls is set to hit theaters on May 3, which will help kick off the summer movie season. Be sure to check out the new trailer from the UglyDolls YouTube channel below.